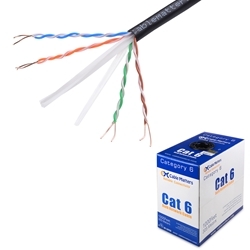 * The Category 6 cable (Cat6) is the cable standard for Gigabit Ethernet and other network protocols. This cable supports up to 550 MHz and is suitable for 10Base-T, 100BASE-TX (Fast Ethernet), 1000BASE-T / 1000BASE-TX (Gigabit Ethernet) and 10GBASE-T (10-Gigabit Ethernet). * Our cables are made of 100% bare copper wire as opposed to copper clad aluminum (CCA) wire, therefore fully compliant with UL Code 444, which require pure bare copper wire in Cat6 communications cables. This high performance bulk cabling is perfect for your custom network installation projects. Our Cat6 patch and bulk cables are used by major data centers around the world. * Cable Length: 305 m/1000 ft.